Libya - IOM Libya, accompanied by German Ambassador to Libya Dr. Christian Buck and Dutch Ambassador to Libya Eric Strating yesterday (24/11) visited the main sea port in Tripoli and Triq al Matar migrant detention centre. During the one-day visit, facilitated by IOM Libya and organized in close collaboration with the Libyan Coast Guard, the Directorate for Combatting Illegal Migration (DCIM) and the Libyan Coast Security, the delegation met with Libyan Coast Guard and Coast Security officials. 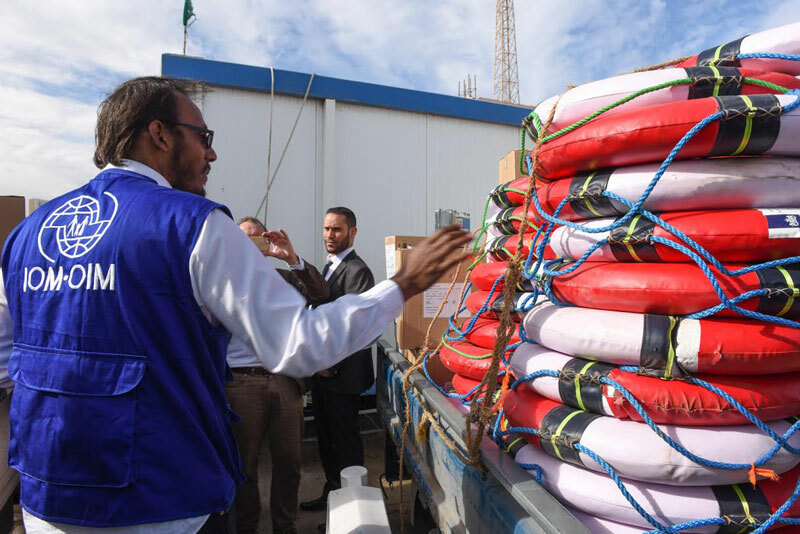 Dutch Ambassador Strating handed over lifesaving equipment, including life jackets, life buoys, foil blankets, torches, satellite phones and first aid kits, which will enhance the Libyan Coast Guard’s capacity, as well as 10 laptops and 10 desktop computers to be used for establishing a data base of rescued migrants. A fully-equipped health clinic, funded by the UK’s Department for International Development (DFID), was also handed over during the visit to Coast Security officials. The clinic will assist rescued-at-sea migrants, including women and children, who arrive, often suffering from dehydration and in dire need of medical help. The delegation also inaugurated a shade, shower, toilet, water tank and sewerage system, funded by EU’s Regional Development and Protection Programme (RDPP). The delegation then travelled to Triq Al Matar detention centre to meet with detainees, who currently include 537 men, 100 women and 13 children. At the centre, IOM repatriation unit staff conducted interviews with migrants interested in assisted voluntary return to their countries of origin. German Ambassador Buck, who handed over clothing and hygiene kits to the detainees, described the visit as “deeply moving.” “We witnessed human tragedy, suffering and the will to deal with this difficult situation. We support the work of IOM and humanitarian NGOs in these centres and count on the Libyan authorities to grant them continued access,” he said. In 2016, some 15,385 migrants have been rescued by Libya’s Coast Guards. But their limited resources are still insufficient to respond to all incidents at sea, given the thousands of migrants trying to reach Europe in often poorly equipped and unseaworthy boats.